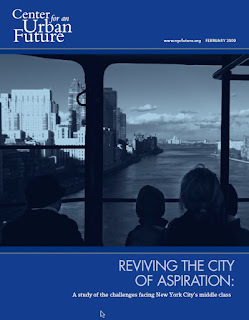 A report released last Friday by the Center for an Urban Future, titled Reviving the City of Aspiration, lays out the daunting challenges faced by the middle-class in New York City and lays out some potential solutions. As the city economy boomed over the last dozen years, city leaders expended a large chunk of New York’s economic development and planning resources on costly sports stadiums and glitzy developments like Atlantic Yards, Governor’s Island and the new Penn Station—projects that garner headlines and facilitate huge private profits, but do little to shore up the basic building blocks of life in the five boroughs. The opportunity cost came in investments not made to increase the frequency of subway service, create new express bus and ferry routes and renovate critical infrastructure—projects that would help reduce commuting times and improve New Yorkers’ quality of life. Local officials must now make it a priority to undertake these infrastructure projects, while continuing ongoing efforts to improve public schools and reduce crime. None of the news coverage last week picked up on this one. The issue isn't completely cut and dried. Surely a new Penn Station is needed, and Atlantic Yards would include some infrastructure improvements. But the economic case for a new arena--capturing revenues from New Jersey--has declined steadily as the city put more money into the project, and it may well be a money-loser. It’s also true that fixing roads, adding subway lines and building schools don’t garner headlines and campaign contributions to the extent of stadium development and business-friendly rezoning. Ultimately, though, a new emphasis on the unglamorous basics might be the key to saving middle class New York—both for the tangible results, and by giving a sense that our leaders are engaged not just on behalf of art stars and Wall Street’s wizards, but the lower-profile engineers, carpenters, computer technicians, nurses and graphic designers who give the city its full character.